This beautiful resort boasts a picturesque setting on Bavaro Beach, surrounded by the crystal-clear waters of the Caribbean. The resort offers 168 splendid Platinum Suites, 32 Honeymoon Spa Suites, 82 Junior Suites, and 556 spacious and fully equipped Bungalow Suites, affording comfort and relaxation. 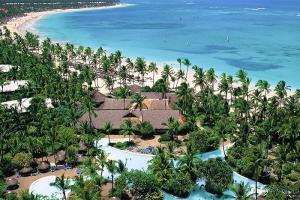 Located on the east coast of the Dominican Republic, about 25 minutes from Punta Cana International Airport. International Buffet Restaurant, Buffet El Gaucho, Italiano Bella Pasta, Fish and Seafood El Pescador, Chopin Restaurant, Oriental Sakura, Japanese Restaurant (Teppanyaki) Tanuki, Steak House Estilo Argentino El Gaucho, Gourmet Restaurant Licey, Restaurante Chill Out Café del Mar, Snack Mc Princess. Iberostate Bavaro Golf & Club, Rancho Macao, Bavaro Beach, Pedrito Punta Cana - Day Tours, Plaza Bavaro, Power Adventures, Punta Cana Expert, SEAPRO Divers.